FLOOR STANDING ENCLOSURES Our range of Floor Standing iPad and tablet enclosures is one of Rugged & tamper resistant secutiry solutions. Due to its versatility and wide variety of options available as standard. Choose from an enclosure with a minimalistic pole or a kiosk with a graphic panel, which can be fully customised with any business or marketing design of your choice. 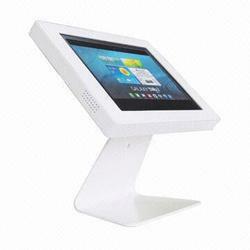 We offer a wide range of off-the-shelf enclosures, kiosks and stands that fit virtually any tablet or device. Our tablet enclosures fit Apple iPad, Samsung Galaxy, Google Nexus and Microsoft Surface ranges as standard and every kiosk, E.POS unit, display stand and terminal we make is fully lockable and secure. 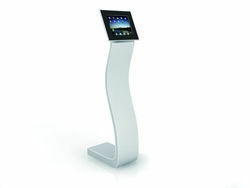 The freestanding iPad Kiosk is a great way to interact with your customers in many retail environments including Car Showroom & trade show booths, hotel lobbies, university directories, point of sale etc. The highest quality aesthetically pleasing Kiosks precision manufactured in the INDIA. Please enquire for any specific specifications or the iPad 2 version. 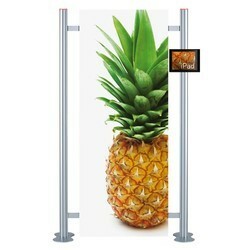 Clip frame easily displays A3 (297 x 420mm) or A4 size graphics or posters. Easy to change graphics require no tools. 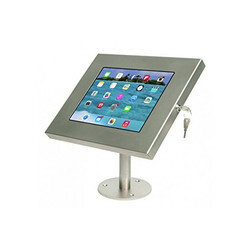 The tablet stands are lockable displays that can be placed in public areas with little worry of theft, allowing employees to focus on interacting and helping visitors. The nylon lock nut secures the frame to the center pole, with a unique hex screw keeping the tablet safe. Tablet stands include many sizes, makes, and models that allow you to set your business apart from the competition. Our wide range of products includes floor mounts, counter-top clamps, and wall mounting holders that ensure that whether used in a trade show, exhibition, retail store, or other location, the tablet kiosk will provide a stylish interactive experience! 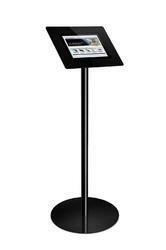 The I28 is anti-theft height adjustable iPad floor stand with lock, is designed for securely displaying in the public. ± 90° Tilting and height adjustable tube allow the installed iPad to face the large audience and avoid light reflection. The iPad case is designed with home bottom, power cable and other ports available to satisfy extra operating needs. Power cable and other cables can run along the tube for better organizing. Floor Standing Enclosures Our range of Floor Standing iPad and tablet enclosures is one of Rugged & Safe security solutions. Due to its versatility and wide variety of options available as standard. Choose from an enclosure with a minimalist pole or a kiosk with a graphic panel, which can be fully customized with any business or marketing design of your choice. 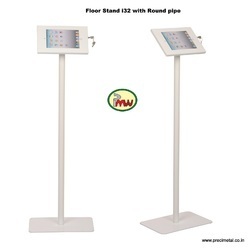 This ipad kiosk stand is equipped with a poster display to draw in attention from customers. While looking for a secure ipad display for public use, look no further! This black finish ipad kiosk stand is sleek to suit many environments including trade shows, retail stores, libraries, and more! Digital and interactive marketing is more popular than ever and this tablet enclosure will bring any business into the modern era of interactive signage. This comparatively affordable and sleek enclosure makes it a simple to convert from regular marketing to the most up-to-date form. These tablet holders with diffrent finish suit nearly any décor. This tablet holder is among a large selection of sizes and styles. Businesses will find it simple to choose an enclosure to suit individual needs. • This iPad mini Stand is secured and re-enforced with a solid lock and key. iPad enclosure comes with T-bar slot for Kensington iPad lock. • Can be mounted directly to the wall or choice of mount. Ipad Display Stand, Unleash the power of the iPad with Pro Line series to create a dynamic sales tool for your stores. Move from static displays to interactive, impactful, and highly relevant electronic communications with your customers to drive increased sales. High quality brushed aluminium stylish iPad podium stand allows potential clients and customers to interact with your display at trade shows, exhibitions and promotional events. It is superb for demonstrating new apps or allowing hands-on interactivity. This tall standing iPad display can be used in either landscape or portrait format for increased versatility. Weighted base makes this stand ideal for busy areas and high foot fall areas. Customised Options available - black or white, Material - acrylic, aluminium and durable steel. Options avaialble for other Mac & Android tablets as per customer requirements. Any tablets can be fitted inside this tablet Kisok solutions for Security. It comes in various vibrant colors, and can be customized to bring out your inner fan. The product's non-skid design ensures that it stays put and won't scratch surfaces. PMW is a durable multi-position stand that securely holds any of your mobile devices. The sturdy framework allows you to interact with your device without having to hold it. Case Dimension: 270* 165* 15mm. · · Tablet dimensions: 16*11*51 inches ( L* W * H ). The iPad Air, Air2 Floor Stand is a highly versatile product ideal for clients looking to provide interaction with their products and services through a free-standing anti theft tablet enclosure. This stand is tough; constructed of high-grade steel with a White glossy powder-coat finish that is scratch-resistant and easy to clean. Compatible with iPad Air, Air2 only 9.7" tablet Simple and sophisticated, the iPad Air, Air2 metal Floor Stand has very elegant and clean surface lines with that make it adaptable to just about any environment. A simple yet highly functional pivot joint behind the enclosure provides wide panning and rotation capabilities. This allows users to view the tablet in a multitude of aspects. The Floor Stand utilizes a standard mounting system, giving users flexibility to mix and match the enclosure and stand with other compatible products. Each tablet Floor Stand enclosure comes pre-installed with a pick-resistant, tubular pin lock, to keep your tablet safe and secure while in use. Charging devices can be a nuisance. The cable management system allows the tablet power cable to remain connected to power but concealed from the public eye. Assembling the Floor Stand is a breeze. The limited number of parts and tools required make the average assembly time less than 5 minutes. Looking for Tablet Security Enclosure Stand ?